Weddings, no matter the season, are the perfect chance to amplify your favourite makeup look. How? Building on the pigment until you achieve a stand-out pop of colour. It's an easy way to enhance your favourite facial feature, without experimenting too much. As we all know, a little bit of experimentation can quickly lead to complete failure (*inner makeup artist voice* 'go on, just extend that liner flick a little further... oh, no, not that far. Oh God. Just st- ahh, too late'), but trying out a bolder version of a proven success is a no brainer. My current summer go-to makeup look is a mix of pink and coral eye shadows on a golden, dewy, slightly shimmering base with natural-looking lips. I know it works, I can recreate it without too much thought, and I'm confident enough to mix it up if I need to. 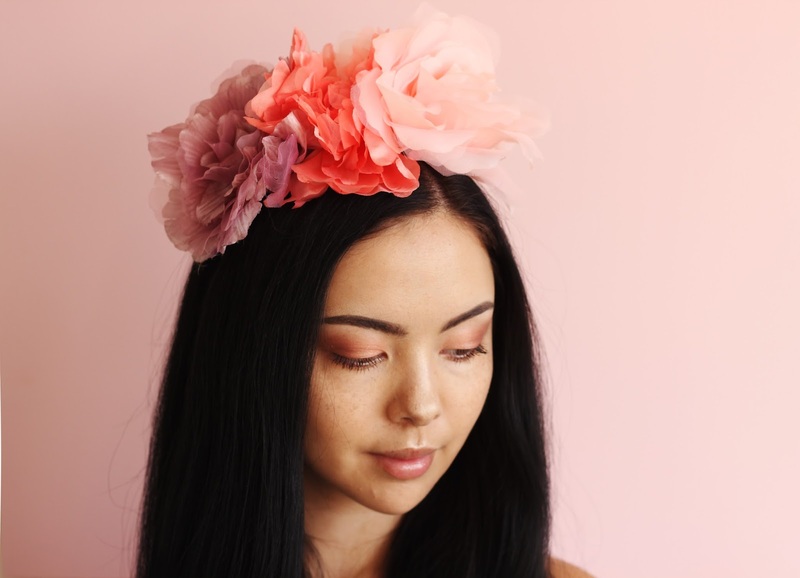 As such, I would definitely wear this for a summer wedding, with an enhanced pigment on the eyes to give the look some purpose - and a beautiful floral headband from Johnny Loves Rosie*. 1. Apply two to three drops of Trilogy Rosehip Oil by patting it onto your skin. If it's going to be a hot day, stick to maximum of one drop so that you still get the dewy look, but also so that the makeup doesn't melt off your face. If it's going to be extremely hot, skip this part and use a dewy setting spray at the end. 2. Cover up any dark under eye circles or blemishes with your concealer. I'm using Black up at the moment because I'm more tanned than usual, and the yellow pigment in the concealer works wonders for my purple under eye circles. 3. Apply a light-to-medium coverage BB cream or foundation. I definitely prefer a BB cream in summer, but use whatever you prefer depending on your skin type. 4. Add a few swipes of Lord & Berry's Luminizer to the highest point of your cheeks, the centre of your nose, and your cupid's bow. Work in with a buffing brush until you reach a soft glow rather than a shimmer. 5. Sweep a primer of your choice over your eyes, then apply the lightest cream shade from the Pur Minerals Soul Mattes Eye Shadow Palette all over the lid with a blending brush. 6. With the same brush, blend the lighter minky pink shade over the outer two thirds of the eye, and slightly over the crease. Work this shade under the eye with a clean smaller brush. Pick a slightly darker shade from the palette and, using the smaller brush, work it into the outer corner of the top lid and bring it under the eye. 7. Using a flat shadow brush, take the shimmering coral shade from the Makeup Revolution Fortune Favours the Brave and pat it onto the lid. Build this up until the shade becomes opaque and you can see a visible shimmer. 8. I used Soap & Glory's Archery to fill in my brows to a soft but defined shape, and held them in place with Benefit's Gimme Brow (my go-to brow product right now). 9. Curl your lashes, and finish with a few coats of Perricone MD's No Mascara Mascara. Tell me what you think of this look, and whether you tried to recreate it!